A flooded basement in your Kansas City home can be overwhelming and exhausting to deal with and unfortunately it can happen in any setting or type of home. That beautiful, finished basement that you love, that you spent thousands of dollars on renovating and customizing to your specific needs, has suddenly been deluged with water, ruining the carpet, soaking up all the stuff on the floor, saturating the baseboards and drywall and furniture and drowning your electronics – so now what to you do? Whether it was rainfall or problems inside the home that caused your flooded basement – the issues remain the same, and the most important thing you want to avoid right off the bat is mold growth. That means you have to get the water out of the flooded basement as quickly as possible. If you’re lucky you’ll already have a sump pump installed, and at least one floor drain; but the drain can fill up and get clogged and the sump pump might not be big enough to handle the job. Hopefully, you have already taken some flood prevention steps to protect your basement when flooding occurs and have an emergency plan to provide for your family’s welfare until you can return to your home in place. But if not, don’t worry – you still have options. First, shut off power to the basement – electricity and gas. If you don’t know how to do this, call a qualified electrician before entering the room and beginning to work. Wear rubber boots and gloves and a protective mask. If you’re a sportsman, you may have on hand a pair of hip waders – they will work great. Walk carefully – you want to prevent a slip-and-fall from happening. If the water is caused by a leakage in the home, shut off the source. Next is to get the water out of the flooded basement – a sump pump, a pool pump, a wet/dry vacuum or a mop and bucket will work, or you can rent a machine from a supply store. Move water damaged furniture and other items, except for electronics, out to dry, either outdoors or in a well-ventilated area. Don’t touch electronics (televisions, stereos or lamps), even with the electricity turned off. It’s better to let those things dry in place. Tear out the carpeting and remove it from the flooded basement as soon as possible because it keeps the floor underneath from drying. It can be hard to dry out wet carpet but sometimes it can be saved. A restoration specialist such as AAS Restoration, or a carpet cleaning contractor, can provide information and make recommendations. Keep in mind that if carpet isn’t dried properly, it can harbor mold and mildew. 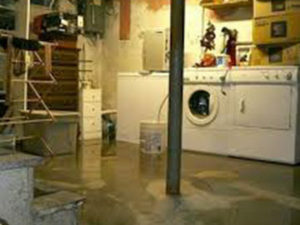 Allow several days for your flooded basement to dry out. Leave windows and doors open to allow for ventilation, and use fans to improve air circulation. You can rent industrial fans as well.• Now comes the clean-up by washing down the floors and walls to remove dirt and sediment that has been left behind by the water. Tear out all the wet, damaged drywall and insulation as soon as possible in order to prevent mold from spreading. Once the floor and walls are dry, use an anti-mildew spray to discourage mold and mildew from developing. Be sure to call your homeowner’s insurance company to report the flooded basement. You might choose to consult a basement waterproofing company, a disaster restoration specialist or a combination of specialists to help with your flooded basement.